We have three AKC female German Shepherds that are part of our breeding program today: Jett, Abbey and Lakota. We have carefully selected each one for their specific and unique traits. Read more about each of our females below. Jett's actual name is "Jett Propulsion" - you know, like a rocket. And there's a reason for that. Jett is f-a-s-t ... she's our speediest dog. And she is ALL about her ball. She takes her ball with her to go potty. She brings her ball back to the porch at night. She puts her inside ball on the couch and pushes it toward you with her nose to try to entice you to play a late-night game of ball. She literally lives to play ball. Why does this matter to you? German Shepherds that love to chase balls have what "dog people" call a "strong prey drive." And that means business. If you want a dog for home protection or police work, a strong prey drive is an admirable quality. Jett will NEVER - and I mean NEVER - stop till she achieves her goal - whether that goal is retrieving the ball you threw 100 times already or hunting down a bad guy - she always finishes the game. 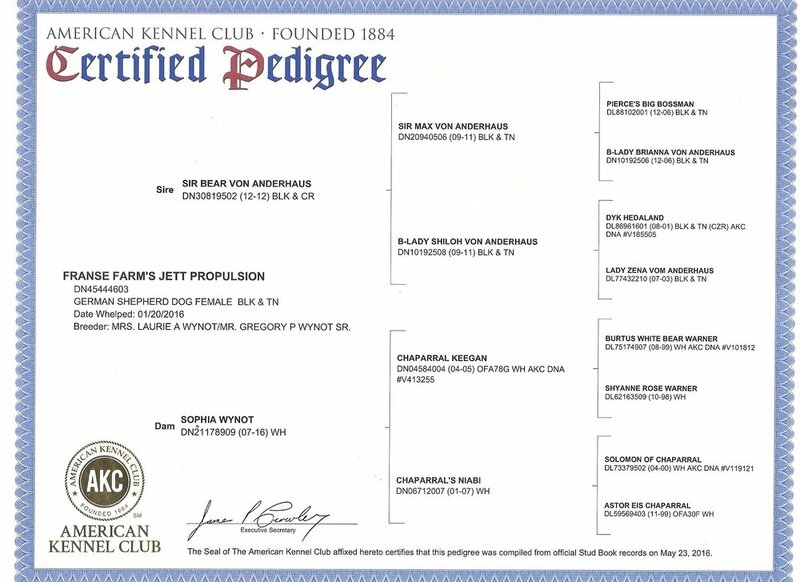 Jett is a black-and-tan short stock coat AKC German Shepherd. She has a high prey, retrieving and hunting drive and an affinity for airborne scents and tracking. Abbey is a strong protector with a fierce bark. She's the first to alert us when strangers come to call - and when anyone hears her staunch warning, they pay attention. An independent thinker, Abbey is also attentive and obedient, easily trained and responsive to commands. While she takes her role as guardian seriously, Abbey is also very warm and approachable. Want to see her inner puppy come out? Watch her with our teenage daughter with whom she has developed a deep bond. She loves us all - but our daughter is her clear and absolute favorite. Abbey is at her most playful as she frolics alongside our daughter outdoors, rolling in the grass and begging for belly rubs. Then it's back to work, keeping a watchful eye on home and hearth - just what you want in a pet and lifelong companion. 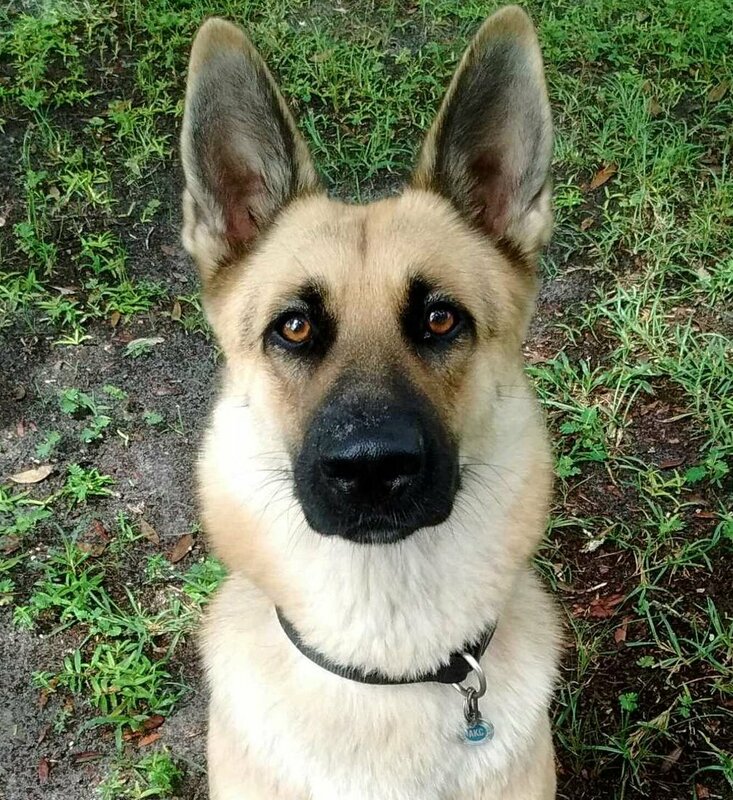 Abbey is a black-and-red normal stock coat AKC German Shepherd with a moderate guard drive coupled with a desire to play with known family/handlers and an easy-to-manage personality. Lakota is a water dog through and through. In fact, it's hard to find a picture of her when she isn't wet. She loves to swim in our pool - and to lounge around in her own plastic kiddie pool too. When she isn't splashing about, Lakota is herding - everyone. Lakota is our safety monitor, always checking to be sure each of our family members is just where they are supposed to be. If we're walking, she wants to stay at the back so she can see everyone and keep them on the right path. Lakota isn't only interested in rules and order, though. She also has a very human-like sense of humor, always looking for an opportunity to steal another of our dogs' toys and hide it from them - you can almost hear her giggle when she does it. Her innate desire to herd and group both people and animals makes her a great family companion and farm dog, but her most impressive quality is her keen intelligence - she is super smart and loves having a job to do. Lakota is a black-and-red long stock coat AKC German Shepherd that is highly intelligent with a moderate herding drive, a deep love of water, and a very strong desire to accompany family/handlers.